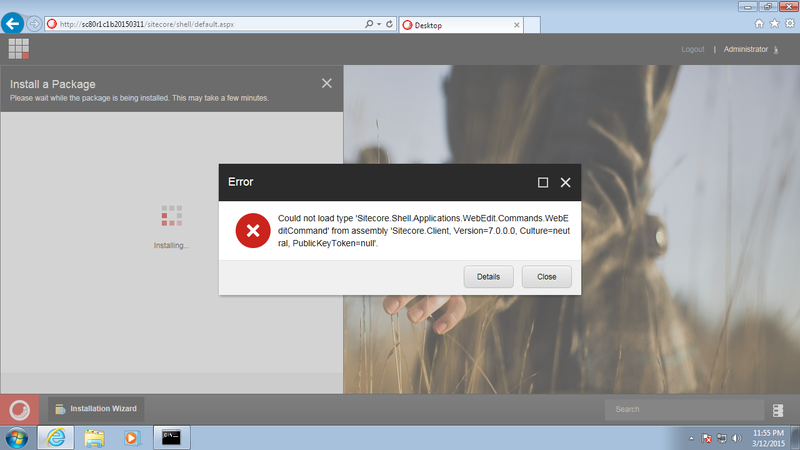 Could not load type 'Sitecore.Shell.Applications.WebEdit.Commands.WebEditCommand' from assembly 'Sitecore.Client, Version=7.0.0.0, Culture=neutral, PublicKeyToken=null'. Exception Details: System.TypeLoadException: Could not load type 'Sitecore.Shell.Applications.WebEdit.Commands.WebEditCommand' from assembly 'Sitecore.Client, Version=7.0.0.0, Culture=neutral, PublicKeyToken=null'. After that i am not able to access several modules including the Desktop! The solution is to download and install Sitecore 8 - Update 2 and the WebForms for Marketers specifically for Sitecore 8.0 on the Sitecore 8 download page. Alternatively, you can contact us regarding a Sitecore Environment QuickStart. Email us at chris.williams@readwatchcreate.com for details.